Larson has two wins this season, fewer than both Martin Truex, Jr. (3) and Jimmie Johnson (3). But those two wins don’t do justice to just how dominant Larson has been all season. Larson finished second this past weekend in New Hampshire, despite starting the race at the back of the pack due to an inspection failure. It was his seventh — yes, seven — second-place finish this season, giving him nine top-two finishes in just 19 races. 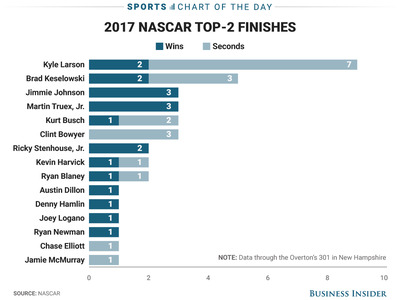 And that doesn’t count the Daytona 500 where he was leading on the final lap before running out of gas, or the All-Star race in Charlotte where Larson finished — you guessed it — second. Larson’s nine top-two finishes are four more than any other driver and suggests that the 24-year-old from California should be favoured to win the Cup once the playoff chase begins.